Following an article in a German magazine about the French “marketing specialist” Clotaire Rapaille, I’ve recently written a longer blog post on my sanitation-related blog and openely wondered if there is any toilet code in a culture, and if so, how it will be triggered. 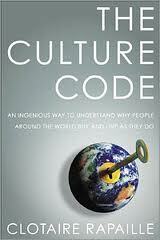 Clotaire Rapaille, who runs a company that tries to explore the “hot button” in each culture, also published a book called “The Culture Code – An Ingenious Way to Understand Why People Around the World Live and Buy as They Do”. The idea of having someone actually trying to make a connection between consumer behaviour and how a particular society / swarm acts because “it’s in their culture” triggered my interest and actually made me buy this book – and this although Rapaille received a lot of hatred and anger over his remarks on the “code” of the City of Québec in Canada. I was reminded of this culture code thing today when I openely tweeted about the many demand media and rss-feed link farms from India vs. original content and tried to explain – with Rapaille’s words! – that “Indians are at root a practical people”, which is why they wouldn’t waste time on reinventing stuff. Now, India of course isn’t about copying foreign works and I truly believe that a lot of innovations and understanding in today’s “civilized” world actually hail from the Indian continent, BUT this “are practical people” somehow stuck with me because I believe it to be very true. And that’s exactly my reason for today’s blog post: like my post on “The Africans” the other day, there’s always this danger of making such public statements. “Germans, Indians, Kenyans, Spaniards – they are all so and so”. You’ll instantly be hated by your readers if you make such general statements because in most cases they’ll reply with a “WTF? !” and will start arguing with you. Of course we’re not all the same, and I myself am probably a good example of why such phrases don’t make sense, but despite all our differences, I think there’s still this culture code thing, the hot button as Rapaille calls it, which defines a common nature within a given culture. Something from deep down within, something from the “reptilian brain”. It may not be the ultimate code that will explain all actions in a society (of course not), but if one of these identified culture codes could help to fix some of the problems we’re currently having out there in this world (e.g. wrong management that will lead to famines, exploitation of natural resources, wrong priorities, injustice, wars, etc. ), then I am all for these codes. Which gets me back to my sanitation-related blog post and the question, if there is any culture code in toilets. Well, is there? How come that in Japan consumers spend ~ 2500 EUR on a computerized toilet while in other, poorer societies, a toilet is at the very end of the wish list? And this while the toilet thing affects all humans on this planet? A question which – according to Rapaille (or Freud? :-) – makes me think we should seat our kids on 2000 EUR toilets only to trigger such a demand at a very early age.